A top official of Iraq’s autonomous Kurdish region is calling on Turkey to let volunteer fighters through to the besieged Syrian city of Kobani, where Syrian Kurds are waging a desperate battle against Islamic State (IS) militants. Speaking on a visit to RFE/RL in Prague on October 13, Falah Mustafa, the foreign minister of the Kurdish regional government (KRG), said Ankara should heed calls from the international community to help the city, which has been under siege for almost four weeks. He said Ankara should establish a corridor between its border checkpoint of Mursitpinar and Kobani, whose northern edge is less than a kilometer from the Turkish frontier. “We are not asking for the impossible,” Mustafa said. “For a corridor to be opened for those who are ready to go and join [the fighters in Kobani], because they need weapons, they need ammunition, they need medical assistance, and they need foodstuffs. Ankara ruled out a call on October 10 by the UN’s special envoy for Syria, Stefan de Mistura, to open the border to volunteers. 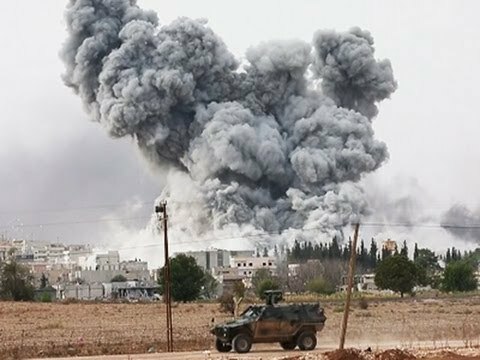 De Mistura said Kurdish residents in Kobani “will be most likely massacred” by advancing Islamic State forces if the city falls. He said there were up to 700 mainly elderly civilians still inside the city center and another 10,000 to 13,000 people gathered nearby, all of whom are at risk. Cavusogly also expressed fears that any weapons reaching the YPG, the Syrian Kurdish militia defending Kobani, could ultimately find their way back to Kurdish separatist militants in Turkey. The YPG is allied to the Kurdistan Workers Party (PKK), which fought Ankara for Kurdish autonomy for over 30 years. Both Turkey and its Western allies consider the PKK a terrorist group. Turkey has been rocked by protests by Turkish Kurds demanding the border be opened to volunteer fighters, many presumed to be veterans of the PKK. The death toll from the protests has risen to 31 following the death of a man injured in demonstrations in Turkey’s southeastern province of Diyarbakir on October 10. The Iraqi Kurdish foreign minister told RFE/RL that Turkey was wrong to put its domestic concerns about the PKK ahead of defending Kobani, the largest Syrian Kurdish city. He said IS presented a threat not just to Syria and Iraq but to all neighboring states of the region and that Ankara must help those groups that are capable of fighting the militants. Ankara, as a member of the international coalition against IS, says it will not take part in ground action but will make its bases available to the coalition for training Syrian rebel forces and for conducting air strikes. But Turkish government officials have told Western media privately that Turkey would accept only 4,000 opposition fighters and that they would be screened by Turkish intelligence. The screening would likely rule out fighters from the YPG, despite the fact the group has proven to be the best organized and effective Syrian Kurdish force against Islamic State forces. Syrian Kurdish fighters aided by U.S.-led air strikes continued on October 13 to defend Kobani, where IS has taken control of about a third of the town in recent days. Neither side appeared to be gaining ground as fighting raged on the city’s eastern and southeastern edges. Mustafa said that Turkey must open its border to Kurdish volunteers from Turkey because the other most obvious source of help, the Iraqi Kurds, cannot reach the city. One reason is that Kobani is hundreds of kilometers from Iraq’s Kurdish region, across IS-held parts of Iraq and Syria. The other is that the Iraqi Kurd forces, known as Peshmerga, are tied down fighting the IS along their own front line.